Nintendo celebrates the first year of WiiWare titles, highlighting some of the platforms big releases while looking forward to even greater games to come. Nintendo says that WiiWare removes the economic barriers from console game development, and the past year in WiiWare releases certainly holds true to their claim. Of the 81 WiiWare titles currently available in North America, more than half were created by small independent studios without the aid of a publisher. More than 40 developers have contributed to WiiWare so far, with games like World of Goo, BIT.TRIP BEAT, , and LIT showing off what can be accomplished on a console when publishing restrictions are relaxed. 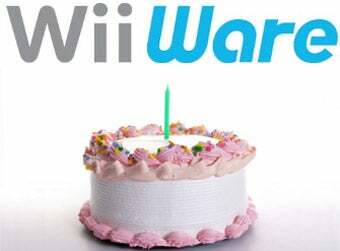 "The first anniversary of our WiiWare service is a milestone that marks how far the service has come and how much great content is currently available," said Cammie Dunaway, Nintendo of America's executive vice president of Sales & Marketing. "We encourage everyone to get their Wii consoles connected to the Internet so they have access to the full range of WiiWare games." So what's in store for Wii owners in the coming year? The list of upcoming titles is arguably far more impressive than anything that's already been released. Nicalis' Cave Story alone is enough to get the heart of any indie game fan pumping, with Super Meat Boy from Team Meat also adding a bit more flavor to the mix. Over the Top Games will be releasing Icarian Kindred Spirits, which is about a winged girl named Nyx who descends from heaven to find her lost friend Icarus in a game that might be the closest we get to a Kid Icarus sequel. Aksys follows up BIT.TRIP BEAT with BIT.TRIP CORE, and Square Enix is sure to outsell everyone with the release of Final Fantasy IV: The After Years. So how has WiiWare treated you this year? Despite having covered the Nintendo Download nearly every week since WiiWare launched, I've only purchased two titles myself - Lost Winds and Pokemon Ranch. I've been meaning to pick up BIT.TRIP BEAT but simply haven't found the time. So that's three out of 81 that have piqued my interest. How about you folks?